Background: The etiology of vasospasm after brain tumor resection remains unclear. This is the first report of diffuse cerebral vasospasm following resection of a schwannoma located in the left portion/part of the ventral medulla oblongata. Case presentation: A 16-year-old boy presented with dizziness and projectile vomiting without apparent cause three months before admission. Magnetic resonance imaging revealed a space-occupying lesion in the left portion of the ventral medulla oblongata. The tumor was completely resected. 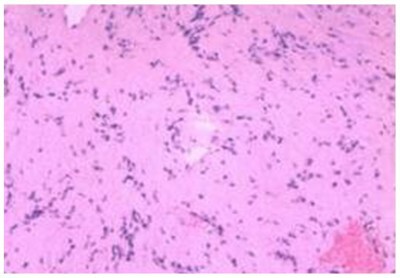 Pathological examination was consistent with diagnosis of schwannoma. Three days after surgery, the patient was in an unconscious state. Magnetic resonance angiography revealed the occurrence of cerebral vasospasm, with ischemic infarction and segmental cerebrovascular stenosis. Seven days after surgery, dehydration therapy was carried out and decompressive craniectomy was performed in the frontal and temporal areas. Despite treatments, the patient was in a persistent vegetative state after surgery, with normal vital signs. Conclusion: This was an uncommon occurrence of diffuse cerebral vasospasm following the resection of schwannoma. Appropriate management of this condition is uncertain, but aggressive treatments including expansion of blood volume and relief of spasm should be performed to treat postsurgery vasospasm.